Report; Reaction; How did you rate the players? Well, well. That was quite an afternoon, wasn't it? Not a classic in terms of sweet, flowing football but we had drama aplenty, lots of talking points, and all the goals were pretty tasty. Celtic looked to be cruising at 1-0 up against 10 men after Alfredo Morelos' latest red card but Rangers responded well after the break and deservedly drew level. Home players were dropping like flies then the champions conjured up a late winner after a mistake from James Tavernier, who had been having a stormer of a second half. Remember to tune into Sportscene, BBC Scotland, at 19:15. I'm off for a lie down. Enjoy the rest of your Sunday. Celtic and Rangers players clash after final whistle following the Parkhead side's 2-1 win in the third Old Firm game of the season. Celtic striker Odsonne Edouard is your man-of-the-match via the BBC player-rater, just shy of a seven out of 10. Ryan Kent led the way for Rangers with 5.88. James Forrest is mobbed by his team-mates after making it 2-1 to Celtic.Image caption: James Forrest is mobbed by his team-mates after making it 2-1 to Celtic. The general consensus is that Rangers have improved in Steven Gerrard's first season but after 31 games the Ibrox side have just two more points than they had at this stage last term. Here's how the table looks now, with Celtic stretching their lead over their closest rivals. The race for European places is going to be fascinating since four points cover the teams from third to fifth. Dundee are now stuck at the bottom with games running out. But there are sure to be a few twists in the relegation struggle. It looks like a double for Celtic as they lead the women's Old Firm derby after three goals in the first 18 minutes. Just before the break Rangers had the chance to pull one back, but Clare Gemmell's penalty was saved with Chantelle Brown hitting the rebound off a post. Josephine Giard, Kelly Clark and Natalie Ross with the Celtic goals. Quote Message: Rangers' fans have bought into Morelos persecution complex. Back in September I wrote about his discipline problems and the Rangers fans came after me on Twitter. The little flick that Brown gave him – you just have to laugh that off. Rangers' fans have bought into Morelos persecution complex. Back in September I wrote about his discipline problems and the Rangers fans came after me on Twitter. The little flick that Brown gave him – you just have to laugh that off. The frustrated Ibrox boss tells RangersTV: “It’ll be a debate, it’ll be what people talk about, but the reality is if you raise your arm you leave yourself wide open. "Obviously he’s been provoked in the first place but it’s happened on too many occasions now and I’ve gone above and beyond – I’ve backed Alfredo more than enough and I can’t defend him anymore. He’ll be punished internally for it and we’ll move forward." You can catch extended highlights of today's game on Sportscene later. The show starts at 19:15 on the BBC Scotland channel. There will also be action from the other five top flight matches played across the weekend. Quote Message: Celtic always possess that threat and belief in themselves. They’re just not prepared to be beaten. That comes from winning seven titles in a row. Celtic always possess that threat and belief in themselves. They’re just not prepared to be beaten. That comes from winning seven titles in a row. Quote Message: I think Joe Worrall looked shaky. He was in bother all the way through the first half. Edouard frightened him. He didn’t look comfortable. When Gerrard sits with Mark Allan and his staff in the cold light of today he will say that he expects more from his players. I think Joe Worrall looked shaky. He was in bother all the way through the first half. Edouard frightened him. He didn’t look comfortable. When Gerrard sits with Mark Allan and his staff in the cold light of today he will say that he expects more from his players. 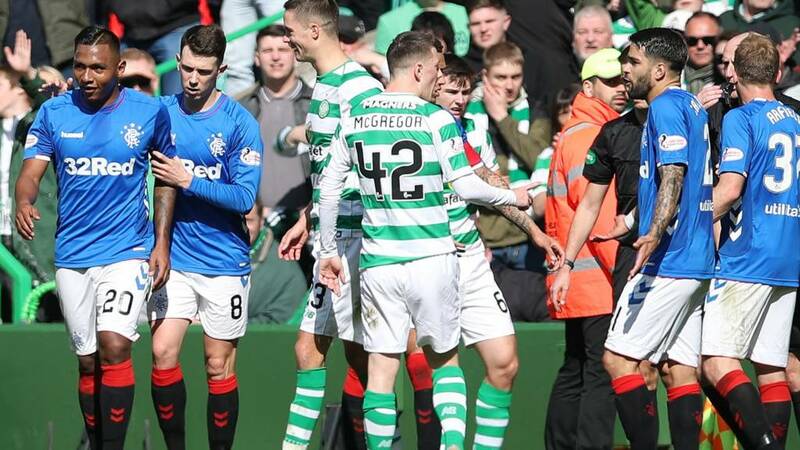 Rangers manager Steven Gerrard is annoyed that Scott Brown escaped any punishment since the Celtic captain was involved in both red cards for his players as well as an incident with Ryan Kent. "You're playing against a player who loves to antagonise," he said at his post-match media conference. "Morelos and Kent are both provoked. Celtic fans have the right to celebrate but to do it right in your face, Halliday has the right to protect his own people. "We've hurt ourselves badly this season with a lack of discipline. I've given my players the benefit of the doubt on too many times. Morelos has asked me for a chat, and that will be picked up. "The gap was already big and it's even bigger now. The buck stops with me and I'm ready for that. We will move forward from this and try to finish the season as strong as we can." Rangers manager Steven Gerrard says he will fine Alfredo Morelos a weeks' wages for his latest indiscretion. Celtic boss Neil Lennon tells BBC Sportsound his team were "naive at times" but stresses his delight with the victory. "We’ve come away with a fantastic win against a very motivated Rangers side," he says. "I can’t ask for any more from my players. "Rangers’ goal made everyone a little anxious. We should have been on the front foot but it was all or nothing for them (Rangers) today. "At 1-0 the game’s always in the balance even against 10 men. We looked a little naive at times but we regalvanised and scored a great goal to win. "I thought Odsonne Edouard was the best player on the pitch by a country mile." "I'm not happy with the treatment Scott Brown got today," Celtic manager Neil Lennon tells BBC Sportsound. "He's been elbowed in the face (by Alfredo Morelos) and he's been punched or pushed in the face by Ryan Kent. Rangers should have been down to nine. It's unacceptable." Quote Message: I think Rangers have got to cash in on Morelos now. The boy obviously doesn’t listen. If you’re in the Celtic dressing room, you’re saying 'noise him up get I his face and see if he reacts'. You’re not telling me that Steven Gerrard has not said to him 'do not react under any circumstances'. So what do you do? Do you just keep accepting it, or do you take your money and run? I think Rangers have got to cash in on Morelos now. The boy obviously doesn’t listen. If you’re in the Celtic dressing room, you’re saying 'noise him up get I his face and see if he reacts'. You’re not telling me that Steven Gerrard has not said to him 'do not react under any circumstances'. So what do you do? Do you just keep accepting it, or do you take your money and run?